Exhausted at School is an investigation into toxic road pollution and its effect on kids’ health at school — the very place they spend hours every day. Read stories from schools across the country inside the pollution plume of our nation’s busiest highways, contributed by members of the Investigative News Network. The project, which was generously supported by the IRE and Google Ideas Data Journalism Fund, is being led by INN and InvestigateWest, an award-winning journalism studio in Seattle. 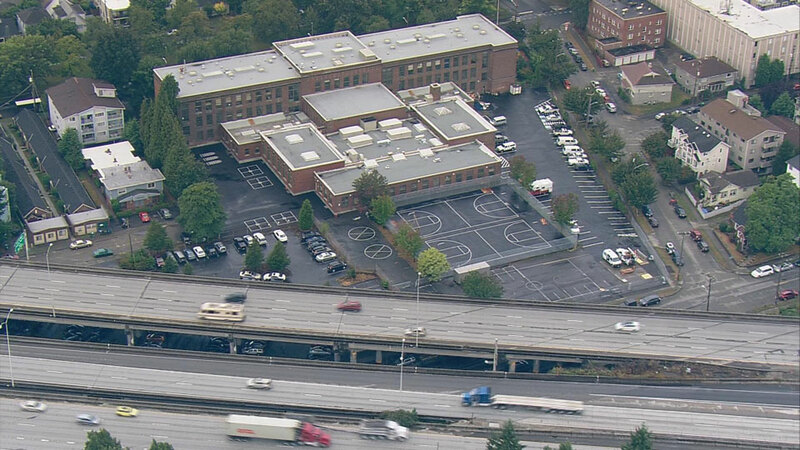 John Marshall Junior High sits next to Interstate 5 in Seattle, Wash. Credit: KING 5. This series is based on public data about school locations and average daily traffic counts on highways and the busiest roadways. Within 500 feet of major roads, traffic pollution often reaches levels considered harmful by air-pollution researchers. Find a detailed methodology here.